When skateboarder Navin Devnani Torres first heard about slacklining 4-years ago, the slacklining culture here in India was only just starting. Bangalore and Pune were the sole breeding grounds for the sport where a few enthusiasts would sporadically arrange meet-ups to learn the sport. This then is how Navin fell in love with the sport. He realised he had naturally gravitated towards the adventure lifestyle, soon taking up a job at Activ8 Sports, a skateboarding company. 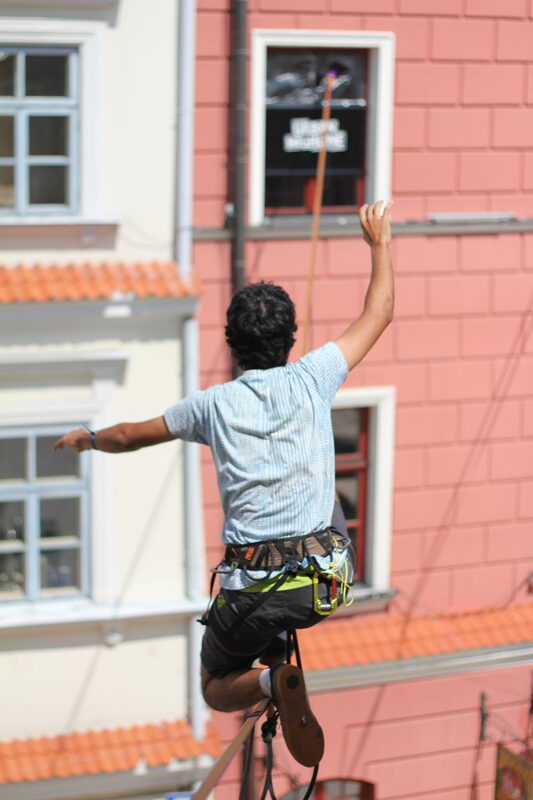 During this period, he made trips to Badami and Bangalore, where various other adventurers such as highliners and rock climbers treaded the lines. Rig, walk, fall, fail, practice; soap, rinse and repeat — the recipe to learning the sport was simple. Navin soon got the hang of it. Later, he quit his job to focus solely on travelling to choose a road less travelled. This was when he first heard about the Urban Highline Festival from his friend and fellow slacker Samar Farooqui. Navin says, “That was two years ago. Samar had spoken about the Festival so enthusiastically about lines which cut through the Lublin cityscape.” A dream secretly took shape. 2018 was the year when that dream to reach the mecca of urban highlining — the Urban Highline Festival was finally realised. Navin who hails from a mixed Indo-Spanish heritage cashed in his chips, and started off on a road trip to Poland, where the Festival has been held, since the last 10 years. 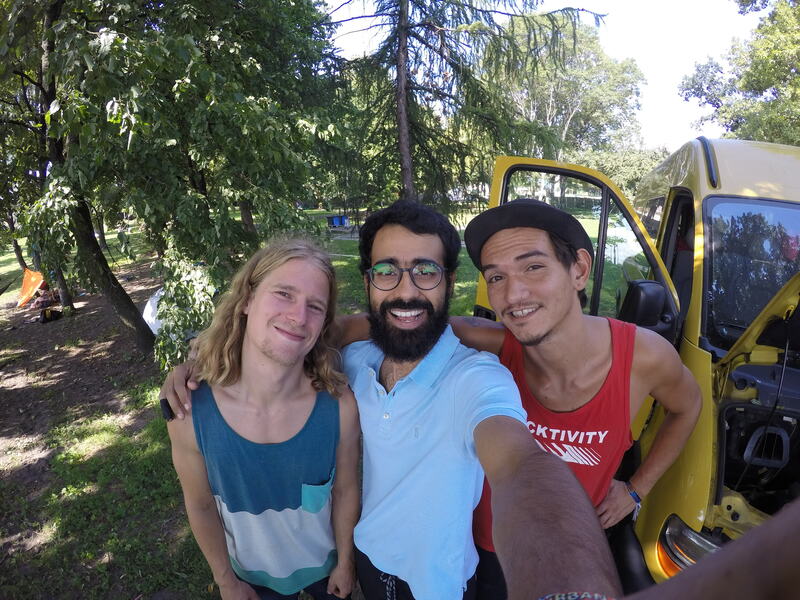 Navin started his journey from Spain where he connected with fellow tribesmen, Jonas Konijnenberg, owner of Slacktivity and American street performer and slacker, Sebastian Segraves. 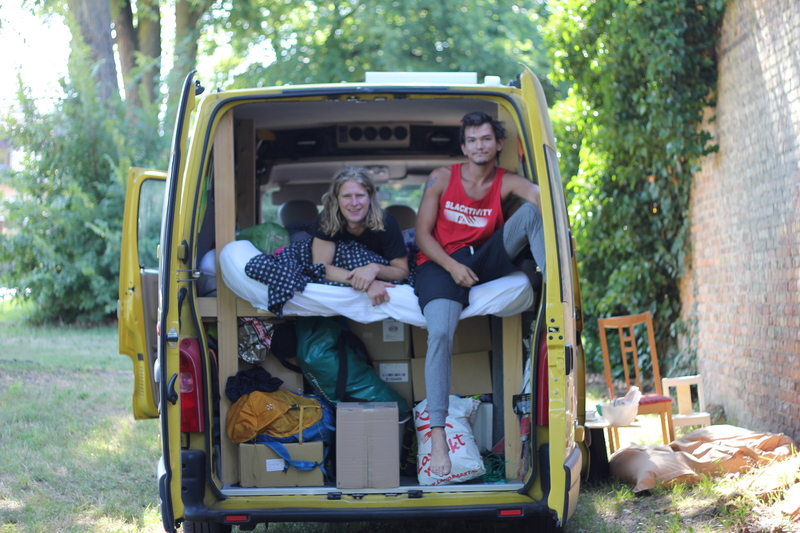 The trio were three uncanny characters, who’d come together by the love of the sport and they adopted the van life to road trip through Berlin, Amsterdam and other European cities, before reaching Poland. With great company, the trip was made memorable as they made camping stopovers, cooked on the fly and encountered multiple police checks along the way. 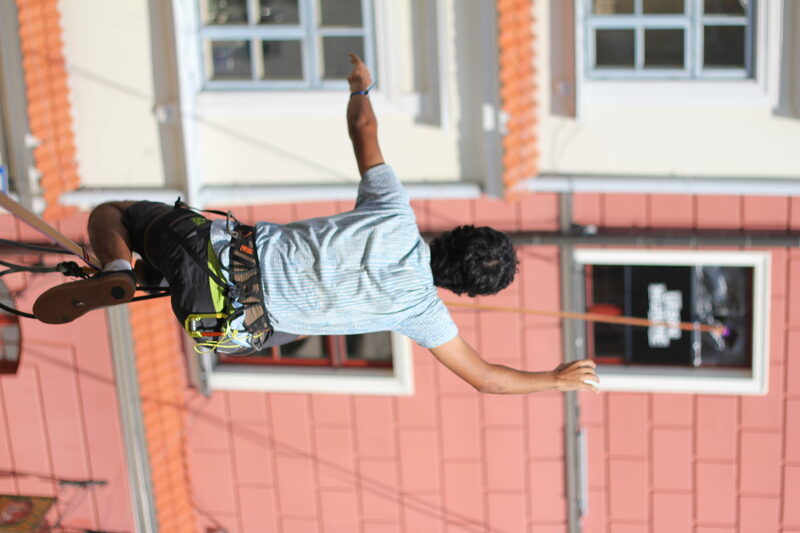 Upon reaching Poland, Navin got his first glimpse of the Urban Highline Festival. 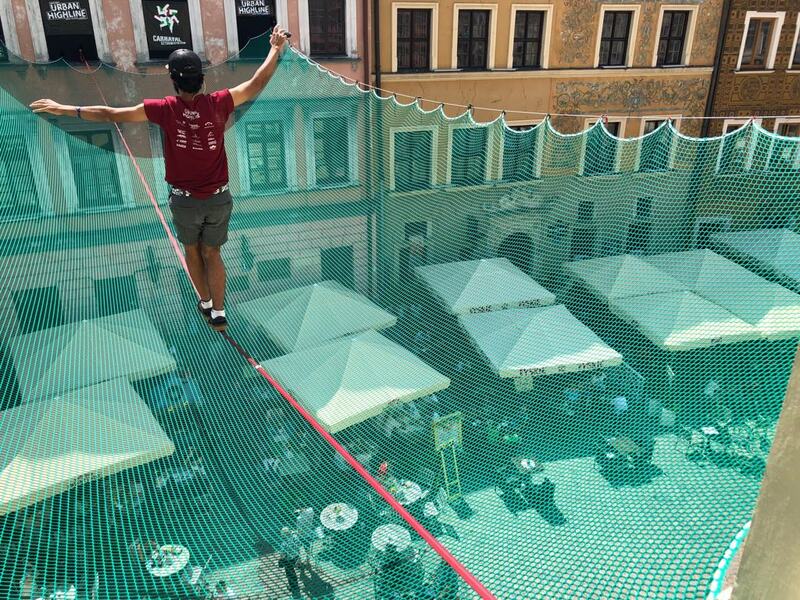 Just 3 km from the historical city of Warsaw, resides the 700-year-old town of Lublin — Ground Zero of the biggest highlining festival of Poland, and quite possibly the world. UHF is a part of Carnaval Sztukmistrzow. 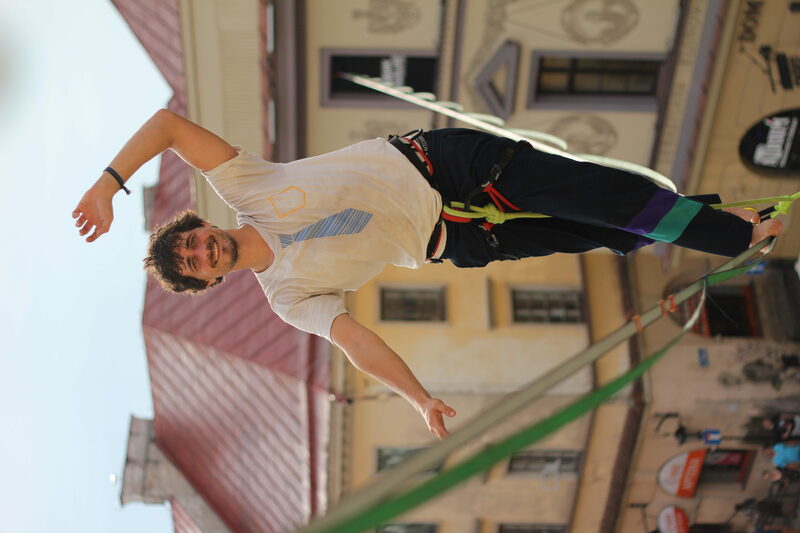 The Lublin Carnival, as its fondly referred to, is a melting pot of European cultures with galleries, workshops, performances, shows and arts mushrooming at every turn. 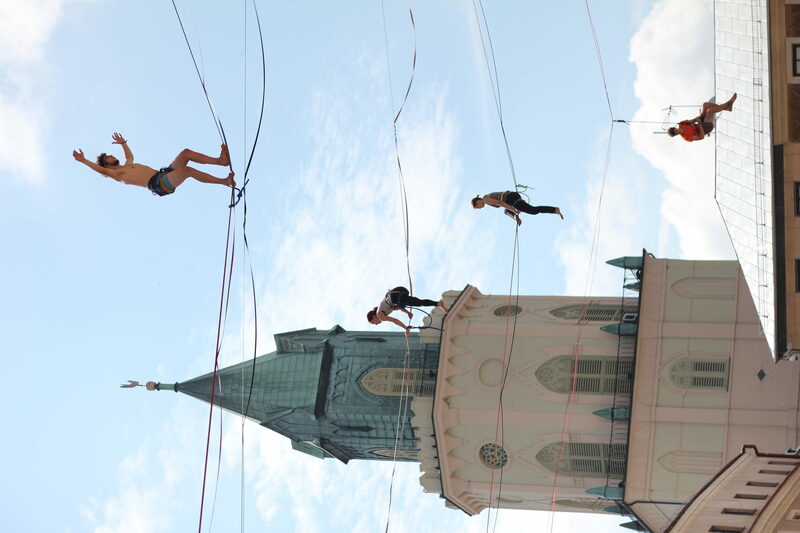 Each year, the city becomes a playground for artists, jugglers and street performers. The buildings become the anchor points and the Festival witnesses hordes of adventurists making their way from all over the world. For the Festival, 16 highlines ( 18 to 88m long), and an airline-trickline over the net, were rigged to be made available for the visitors. Eight urban highlines (18-88m) were rigged at the Tribunal (Town Centre), while two urban highlines (25m long, 27m high) made for the Churchlines at Tynitarska Tower. These lines were made for all sorts of highliners — beginners, intermediates and the pros. 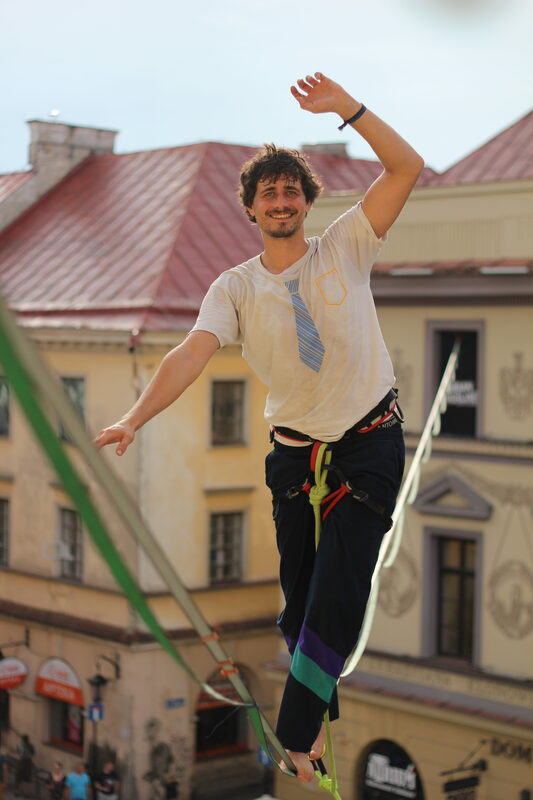 Another slack line of 60 m was organised at Cracovia, where the daredevils showed off their antics to gleeful crowds. 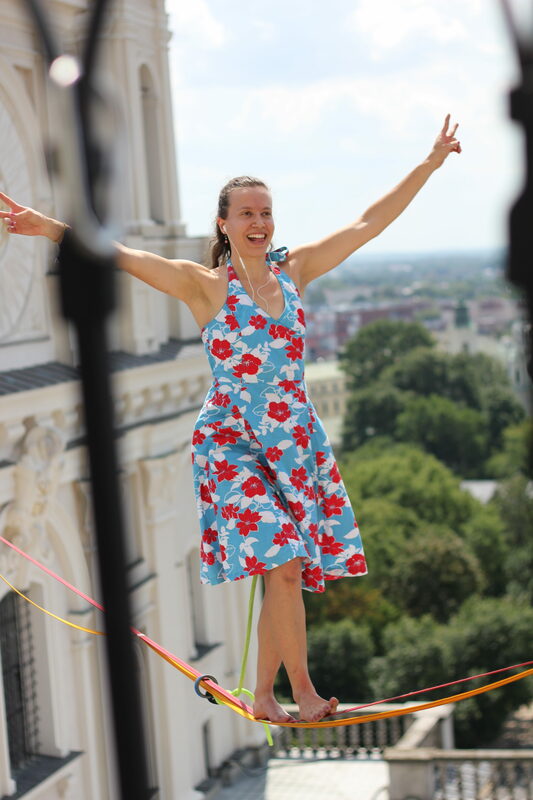 The Festival featured some of the biggest names in slacklining and highlining star at the event. 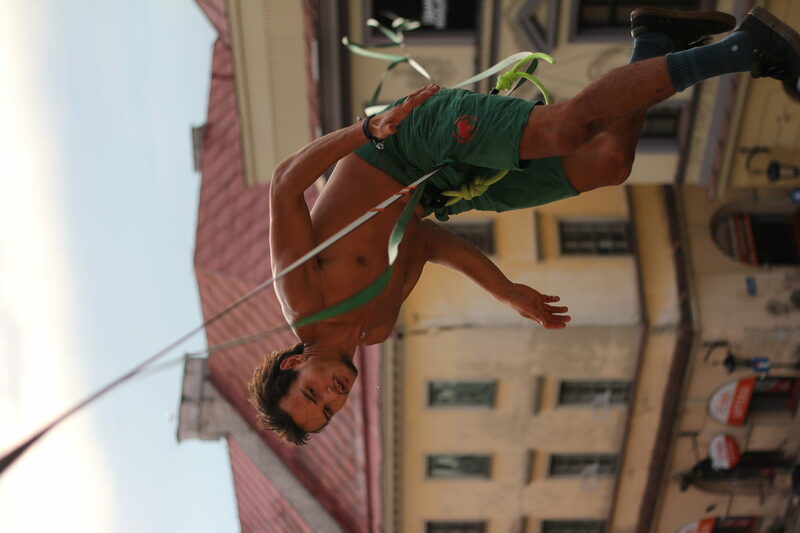 Athlete Pablo Signoret, the Guinness World Record holder for the “longest blindfold slackline walk” over a canyon in Yunnan Province, China, journeyed from France. 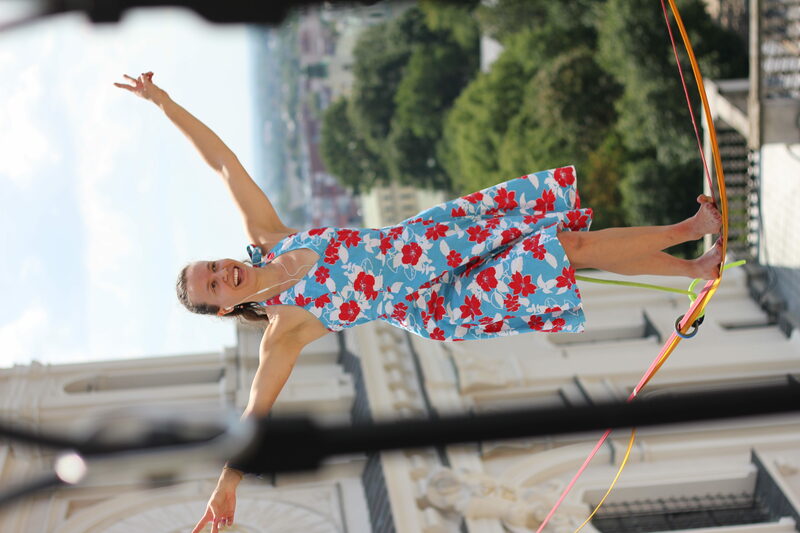 Similarly, German slackliner Friedrich “Friedi” Kühne who set a new free solo highline world record in France at an altitude of 200 metres above a 110-m-long slackline was featured. 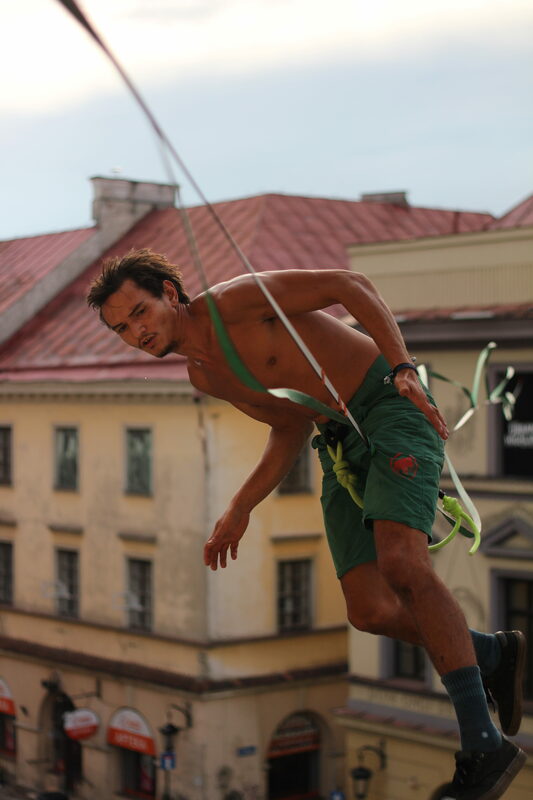 Other headliners included Dany Schmidt (Germany), Can Sahin(Slackline Turkey), Filip Oleksik (Poland, Gibbon Slacklines), JonasKonijnenberg (the Netherlands, Dreamwalkers / Slacktivity), Lyudmil Ivanov (Bulgaria, Slackline Bulgaria), and Benni Schmid (Germany, Slackline Industries). During the 4-day-festival, all these stars hobnobbed with fans and followers to give talks, workshops, training and to walk the lines. PHOTO COURTESY: Navin Devnani Torres.